… and then tried to make sure story never got in the way of game-play. I’m going to start talking about themes and character arcs in a bit. Before there’s any eye-rolling, I fully understand and endorse that writing in games is just a layer of polish. 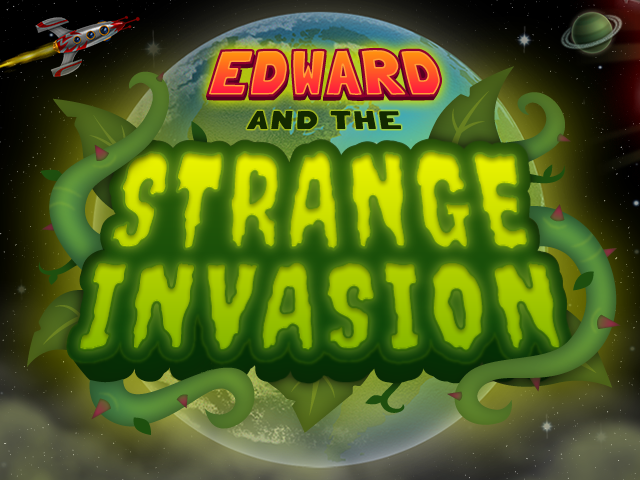 For all my fondness for interactive narratives, emergent storytelling etc etc, Edward and the Strange Invasion was always intended to be a fun experience of exploring from A to B to C and either dodging or combatting the occasional beastie en route. Still, we had this fantastic opportunity to create an original story-world and it’s not like there aren’t already one or two games on the internet about generally moving around and fighting weird creatures. So how could we personalise this apocalypse? In many ways, I think the majority of stories are ‘coming-of-age’ tales whether they mean to be or not: Protagonist wants something, faces challenges and obstacles and either changes or resists change in order to achieve or fail their goal. In this case, once the concept of Edward had been sketched out, I had the vague notion of a boy with his head in the clouds of science fiction, waiting for some alien intervention to come and make his life better only to realise that he’d actually have to do it himself. But, of course, poor Edward doesn’t have the town to himself for long. Not only are there a number of beasties gallumphing round town, but Edward is repeatedly instructed by the mysterious Doctor Zee and Agent X on missions of great importance. The idea that you first encounter these characters as potential imaginary friends or delusional symptoms (ie – that they are figments of Edward’s idealistic view of science fiction) quickly gives way to a bickering pair of characters who ultimately have bungled up their own intergalactic mission so are dumping it on Edward – now he has to get around town performing chores without the other town’s inhabitants getting in his way/eating him. Poor Edward! This is where the idea of Victorian science fiction author E.T. Lunchcraft first appeared – ultimately a figure who had unintentionally taken the reality of the interstellar back-story and spun in it into fun escapist tales. Adding books as collectibles around town not only gave us the opportunity to come up with some daft puns and references to our favourite classic science fiction stories, but the idea of going ‘off-mission’ in order to find an escapist book seemed thematically apt. Ultimately, a lot of the above was just all just sub-text that can all sound a bit poncey to talk about (not to mention largely irrelevant in game-play terms) but this game was commissioned as having a narrative with a definite end point and I wanted to make that ending feel as satisfying as possible. Once we’d gotten the arena of the game and put all our ideas for events, set-pieces, puzzles and battles into a structured list, the script began to take shape, but building up to… what? 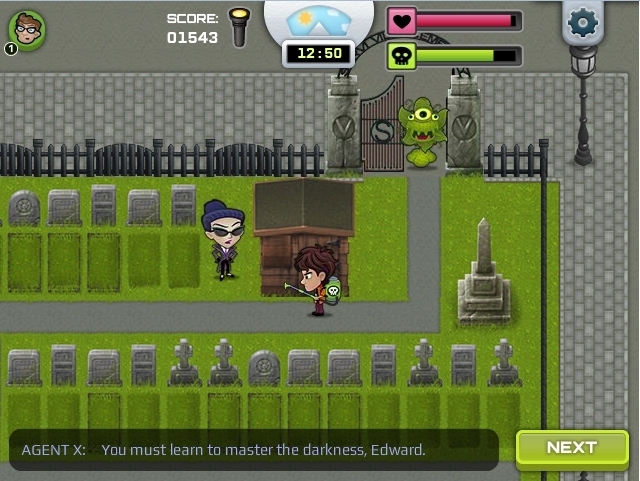 Edward battles a big boss. That’s definitely the end of the game-play. So what could an ending cut-scene add? How could it offer any sense of catharsis after a climactic final fight? This is why I think the petty conflict between Doctor Zee and Agent X along with Edward’s disappointment at their manipulation was so important. We always knew a number of players would skip through the dialogue to get to the good stuff, so to a degree there’s an element of Edward getting annoyed at his mentors in the dialogue too and generally being moderately miffed with the ‘reality’ of this sci-fi scenario. Naturally, we tried to make sure that the dialogue didn’t actually interfere. As with any script, many lines were cut and we had to ensure that Zee and X were also useful in making sure the player always knew what they were meant to be doing. But there are about a dozen lines in the script that I would have fought to keep in had anyone asked me to change them. But no one ever did which hopefully meant that, on some level, we all knew those lines were key. Our design team excelled themselves both in terms of quality and quantity of art assets and animations for this game and our developers worked around the clock to create vivid script engines, lighting effects and the action (flamethrowers!) that are the main draw and (in no uncertain terms) the main point of playing this game. There’s a good chance I overthought about all of this. But this is why I am pleased with how the final cut scene works with the game and hopefully doesn’t just feel tagged on by paying off the battles and story beats scattered throughout. By the time you get there, we’ve already revealed everything were going to. There’s no extra twist. Just maybe the feeling that Edward has completed their mission. Not his. But… now he gets to shake off being told what to do and maybe triumphantly enjoy his own adventures on other worlds. After all, most games tell you what to do all the time – set you challenges then try and make it even more difficult for you. So if players took the time to complete our game, I hoped we could invigorate them with that same sense of triumph and freedom as Edward achieves, having undertaken a journey. Well done, player one – the Universe is yours! 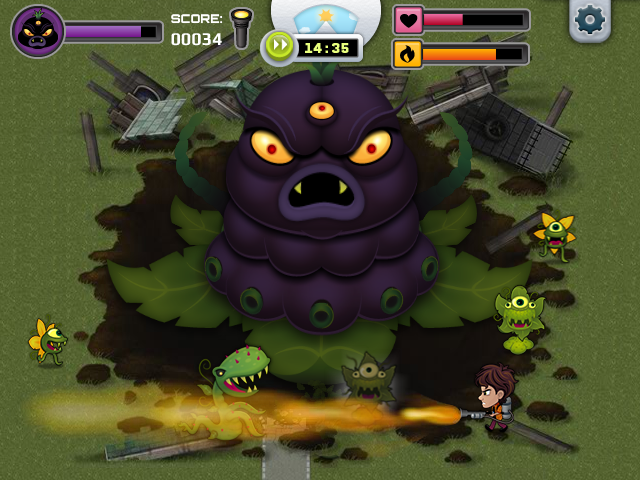 Edward and the Strange Invasion is free to play on Nickelodeon Addicting Games. We hope you like it!